Volleyball block rules are established so players, teams and coaches compete fairly in their quest to win a match. This page is written to provide you with important information that should help you improve your defensive skills in volleyball. Make sure when you get to the front row, you know what you can do and what you can't do while blocking a ball. Volleyball Block Rules: Blocking is the first line of defense. You can jump and place your arms, hands and shoulders over the net to stop a hitter or setter from attacking the ball into your court. Blocking is the first line of defense. a volleyball player can't touch the net on the way up or on the way down with any parts of the body while the ball is in play. a player can't step over the half court line during a rally in a way that keeps the opposing team from safely playing the ball. Only front row players in defense are allowed to block a volleyball. while in pursuit of a ball a player, (usually its a blocker) is permitted to enter into the free zone of the opponent's court as long as doing so doesn't interfere with the action going on. This usually occurs when a blocker steps over the center line and for some reason, often in transition, lands and steps outside of the sideline (but into the free zone) of the opponent's court. Because the free zone is considered the playing area of the court, this is legal and one of the few times a player is permitted to step across the center court line during a rally. In some middle school competition around the country, players can't touch the net or step across the half court line at all. A block touch doesn't count if your front row player attempts to block an opposing hitter but the ball contacts her hands and continues into your court instead of back into the opposing team's court. Then your team, which is now "on offense" still has three more opportunities (a dig, a set and an attack) to play the ball. Let's say you are blocking a hitter and the hitter's ball goes between your two hands because they were too wide and so you didnt stop the ball at the net. When and if the ball continues into the back row and one of your teammates digs the ball, then the dig is the first of the three contacts that your team is allowed to have to get the ball back over the net in an attempt to score against the opposing team. Your block touch or block contact on the ball is not counted in the total touches allowed per team in a rally and since you didnt actually "block" the ball the rally can continue, as if you didnt touch the ball. As long as the ball continues, into your court, or even outside of your court BUT is played by a teammate, then three more contacts are allowed for your team. On the third contact, the ball has to go over the net. Can You Ever Touch The Ball Twice? 6. When blocking, can you touch the ball twice? 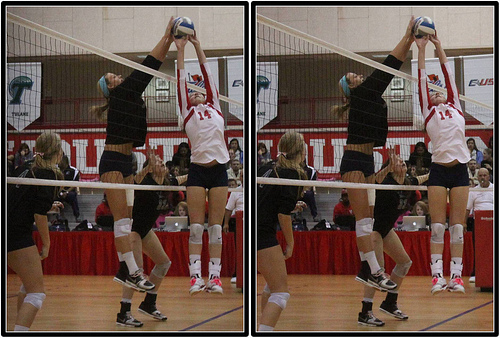 There is an instance when blocking in volleyball when a player can touch the ball twice. It doesn't happen often, but it does happen. Check out these two possible examples that happen in competition. 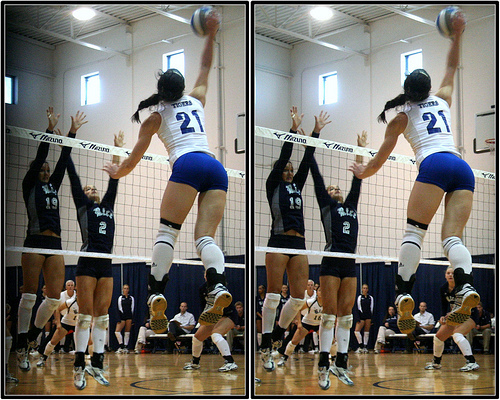 When a front row player is blocking and their blocking hands don't penetrate to the other side of the net, the ball is likely to trickle down on their side between their body and the net. If they can get their blocking hands down fast enough to connect them together to dig or pass the ball, without lifting the ball, then their team is allowed two more contacts, as long as they get the ball over the net on the second contact, they are okay. If the blocker touches the ball as a block and then contacts it again as an underhand contact, her team has two more contacts to get the ball over the net to possibly score a point. This action happens fast and if you don't know the rules, if you attempt to block a ball that ends up dribbling down in front of you, on your side, you may end up catching it because you don't realize that you can keep the ball in play by contacting it again as long as its a passing playing action. That could cost you an important point if you are unfamiliar with the volleyball game rules. There are three major things you can't do when you're blocking in volleyball. 7. Can you block the setter? No. One of the common faults committed by beginner players is trying to block the setter. 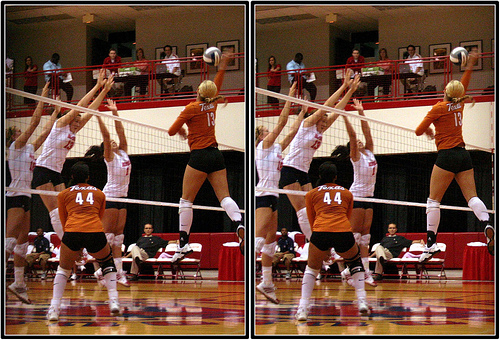 Volleyball block rules prevent you from blocking an opposing team's setter who's attempting to set a ball. You can block someone who's hitting a ball as long as you are separated by the net, but you can't block a player who is setting the ball to another player on their team. Can you block a serve? 8. No you can't. Not according to FIVB and USA volleyball block rules. Players aren't allowed to block the serve either in doubles or the traditional six-man game. The ball has to be allowed to enter into the opposing team's court before the rally can begin. Can the libero block a ball? 9. No. Only front row players can block a ball, either singly, in pairs or in threes. A one-man block is known as a solo block, a two-man block is known as a double block and a three-man block is known as a triple block. Can backrow players block a ball? 10. No. In the six vs six person game a team commits a foul if one of their backrow players tries to come to the front row to help block a ball. Volleyball block rules state that only three front row players are eligible to block a ball in the front row during a rally. 11. In order to score a point, your blocking hands must deflect the ball back into the opposing team's court, to their floor, without any other players getting the ball up. If you block a ball and it bounces out of bounds on your side or the opponent's side or without one of your diggers getting the ball up then its not a point for your team. 12. If you block a ball and it then hits the antenna before hitting the ground, then the ball is considered out of bounds and both the ball and a point is awarded to the opposing team. This is because the blocker is the last person to contact the ball before it went out of bounds so the blocking team loses the ball and the point.